Genovesa Island is located at the inner part of Darwin Bay. This area contains an abundance of frigatebirds and other interesting seabirds. 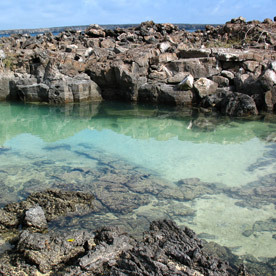 Behind the small beach filled with nesting areas for frigates, red-footed boobies, and swallow-tailed gulls are a number of tide pools. At high tide it is likely that the trail will be covered with water. 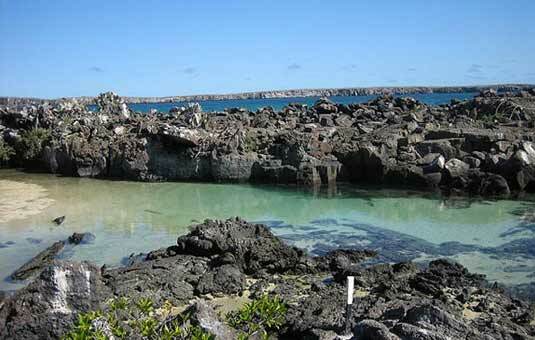 97% of the Galapagos Islands are protected by the Galapagos National Park, and only four islands are inhabited. Genovesa is one of the pristine, uninhabited islands. Also known as Prince Phillip's Steps, El Barranco's steep, rocky path leads up to a high cliff-face. A marvelous view can be appreciated from here. 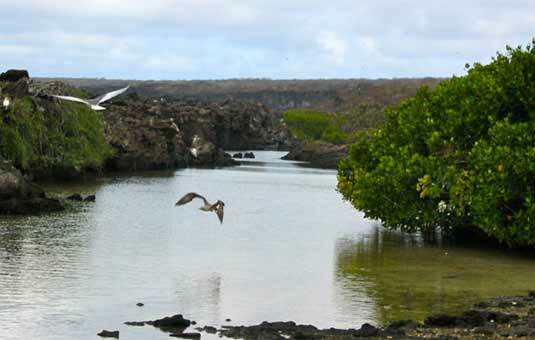 This site is also home to palo santo vegetation as well as red-footed boobies, short-eared lava owls, Galapagos swallows, and Galapagos doves. *Activities will be operated according to each boat itinerary. 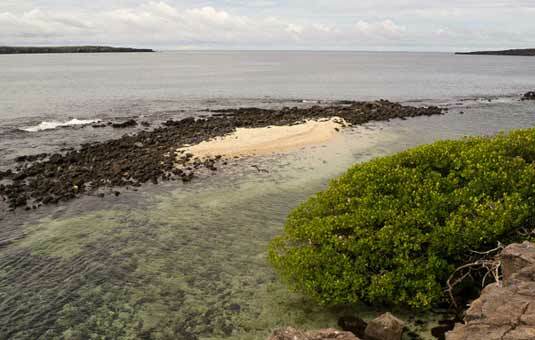 This white sand coral beach heads a half mile trail (0.75km) that winds through mangroves filled with land birds. Nazca boobies, red-footed boobies, and swallow-tailed gulls can be spotted here. Further down the path are tidal pools where sea lions swim playfully. At the end is a spectacular view from a cliff. Located in the northern part of the archipelago, Genovesa (also known as Tower) is known to guides as "bird island" because of the many species of birds to nest there. Because it is somewhat remote, many land species never made their way there, allowing birds to dominate. Visitors are left breathless by the thousands of birds who make their home here: you'll see flocks of storm petrels, mangrove nests of frigates and much, much more. Genovesa has an peculiar semi-circular shape: this is because the entire island is the mostly-submerged rim of a long-dead volcano. One wall of the volcanic rim collapsed ages ago, allowing water into the caldera. The remaining walls of the old volcanic rim make for some excellent snorkeling: you'll see a variety of sealife on and around the crater walls, and the semi-circular nature of the island prevents strong currents and winds, making it an excellent site for novices and intermediate snorkelers. On the island itself, there are two main visitor sites: Prince Philip's Steps and Darwin Bay. 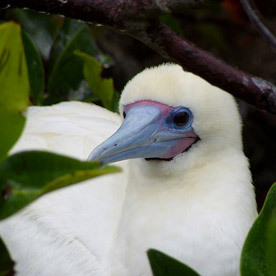 On the sandy shores of Darwin Bay you'll see nesting frigate birds, gulls and red-footed boobies, which although they are more common in the islands than their blue-footed and Nazca cousins are seen by visitors less frequently. Keep your eyes open as you hike around Darwin Bay: there are some tidal pools that occasionally capture some interesting marine life, like rays or turtles. Prince Philip's stepsIf you scale the cliffs via Prince Philip's steps you will see the same birds, plus possibly the elusive short-eared owl, endemic to Galapagos and special because it hunts during the daytime. You'll also likely see finches and mockingbirds on either hike. 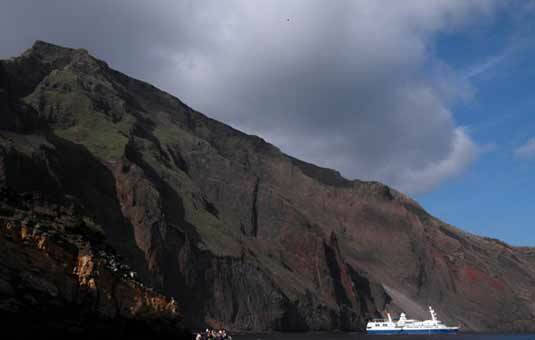 Note that Prince Philip's Steps is a visitor site only available to smaller ships: large groups of visitors might damage the fragile ecosystem there. If your visit allows, try to take a panga ride along the cliffs. Keep your eyes open for a white bird with a long tail: this is the shy red-billed tropic bird, a fairly common Galapagos resident but one rarely seen by visitors.